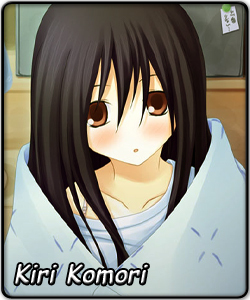 Being a notorious hikikomori, Kiri refuses to come out of her room and spends all day watching TV with a blanket wrapped around her. That all changed when Zetsubou Sensei and Kafuka visited her. After being doubly traumatised, she was begging to let them out of her room and Sensei's compliments made a blushing Kiri come to school. But old habits die hard, so now she's a shut-in at school refusing to leave. Somewhat surprising looks for a shut-in: her pale skin is well maintained (read: beautiful) and her figure is decent. More surprisingly is that she has no problem having a conversation (hikikomori have very poor social skills) and is good at housework too. So long as it's indoors, she can appear almost anywhere (lockers and toilets are not excluded) to scare Sensei, take care of his home (does she teleport?) or provide fanservice. Indeed, to Sensei's cousin she's a tease.